It all started when I received an interesting email from a woman named Marja (pronounced “Maria”). She said she was from Finland and found out about my classes online through the wonderful reviews my students leave on sites like Yelp.com and MeetUp.com. 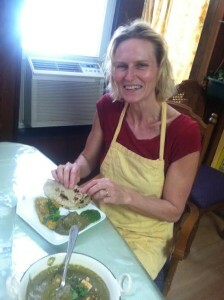 She had been researching for quite a while and came across many other reviews for Indian food cooking classes. Once she found my Meetup site she was surprised at all the positive reviews; she’d never seen so many five-star reviews about any Indian cooking classes in New York City. This made me very happy and appreciative to all my students and friends who took the time to provide their testimonies. She decided to contact me and begin planning her travel all the way from Finland to New York where she would be staying with friends, but primarily she is here just to learn from me! What an honor. Her focus is on South Indian cooking, mainly because she and her husband, who is Indian, want to start a restaurant in Finland. According to her, there are numerous North Indian (Punjabi-Bengali style) restaurants there, but practically no South Indian style restaurants. 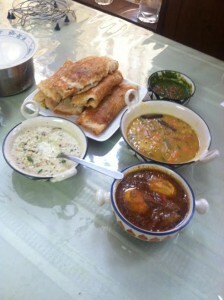 They want to establish a trendy and unique South Indian restaurant with cuisine ranging from Dosa, to Idli, Sambhar, Uttapam, and so on. In preparation for her visit I prepared a customized plan for each of the classes. I want to be able to not only teach her how to cook each dish, but give her insight into why certain spices are added before others and explain the health benefits of using particular spices in her food. I also want to make sure we cover vegetarian options as well. ly, this is one of the most rewarding experiences for me as a teacher and entrepreneur, since I started Mukti’s Kitchen a few years ago. It is also a very new experience; I did not realize that online reviews and Yelp recommendations could actually do so much! I hope you – my friends, relatives, family members and well wishers – also find time to join me here in my kitchen in the coming months. If you would like the opportunity to attend a set of customized classes please contact me. I’ve been playing around with the idea since this has been such a great success. I want to thank all of you who share Mukti’s Kitchen with others whether it be through word of mouth, social networks or comments on websites like Yelp.com. It really makes a difference and you never know what good may come of it.